If and when Bitcoin becomes a mainstream issue, it is going to undoubtedly throw a cat amongst the political pigeons… and doves… and hawks. Up until now the OWS and Tea Party movements have been united in their belief in Personal Freedom, but divided in their belief in Economic Freedom. In the above diagram the OWS would occupy (pun intended) the top left quadrant (left wing), and the Tea Party the top right – Libertarian. The reason OWS opposed economic freedom – as it applied to banks and big corporates – was because it believed that an unregulated environment had led to worsening economic conditions for 99% of the population and unfair gains for the 1%. The Tea Party movement on the other hand, along with the Republicans and the Ron Paul camp, promulgated less government intervention into the affairs of banks and corporates believing that the dymanics of the pure Free Market would automatically rectify any market inefficiencies for the greater good of all. My own view is that on a deeper level this surface split between the OWS and Tea Party was based on different interpretations of how the actual system worked. The OWS believed that the way the US economy is presently structured render free markets nothing more than a hoax. Their belief is that the odds are totally stacked in the 1%’s favour. So actually OWS weren’t opposed to real economic freedom just the false economic freedom as peddled by the corporate lobby. ENTER: Bitcoin. With the Bitcoin monetary system in place the OWS can now say “Cool, lets have the real economic freedom – as Bitcoin will really facilitate it!” and in doing this their position on the above graph shifts from the top left quadrant to the top right Libertarian quadrant where they can join their Tea Party brother and sisters. For the Right Wing Bitcoin is a very thorny issue. True “Economic Freedomists” must surely embrace Bitcoin. If they don’t, they throw their adrent battlecry of “All will be solved by the Free Market” into a very contradictory position. 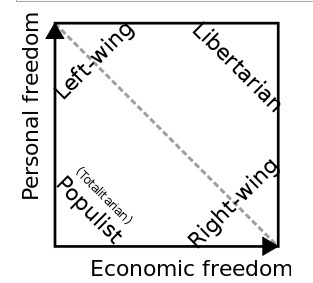 Either they will have to support Bitcoin and retain their position in the bottom right quadrant (and risk upsetting many of their campaign financiers) or they will be forced to renage on their “Economic Freedom” principles and take one step to the left where they will share territory with the Nazi’s and North Korea – the Totalitarian State.